The 2015 AAA 400 was a NASCAR Sprint Cup Series race held on October 4, 2015, at Dover International Speedway in Dover, Delaware. 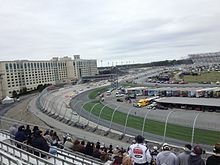 Contested over 400 laps on the 1 mile (1.6 km) concrete speedway, it was the 29th race of the 2015 NASCAR Sprint Cup Series season, third race of the Chase and final race of the Challenger Round. Kevin Harvick won the race, his third of the season. Kyle Busch finished second. Dale Earnhardt, Jr., Jamie McMurray and Aric Almirola rounded out the top–five. With qualifying rained out, Matt Kenseth was awarded the first starting spot. He led 26 laps on his way to a seventh–place finish. Harvick led a race high of 355 laps on his way to winning the race. The race had 14 lead changes amongst three different drivers, as well as eight caution flag periods for 43 laps. This was the 31st career victory for Harvick, third of the season, first at Dover International Speedway and second at the track for Stewart-Haas Racing. The win secured his place in the Contender Round. Clint Bowyer, Jimmie Johnson, Jamie McMurray and Paul Menard didn't advance out of the Challenger Round. Chevrolet left Dover with a 45–point lead over Toyota in the manufacturer standings. The AAA 400 was carried by NBC Sports on the cable/satellite NBCSN network for the American television audience. The radio broadcast for the race was carried by the Motor Racing Network and Sirius XM NASCAR Radio. Matt Kenseth entered Dover with a six–point lead over Denny Hamlin. Carl Edwards and Joey Logano entered tied for third 10–points back. Jimmie Johnson entered fifth 16–points back. Ryan Newman entered sixth 25–points. Kurt Busch entered seventh 26–points back. Brad Keselowski entered eighth 27–points back. Martin Truex, Jr. entered ninth 28–points back. Jeff Gordon entered 10th 31–points back. Jamie McMurray entered 11th 41–points back. Dale Earnhardt, Jr. entered 12th 42–points back. Kyle Busch and Paul Menard entered tied for 13th 43–points back. Kevin Harvick entered 15th 65–points back. Clint Bowyer entered 16th 81–points back. In the week leading up to the race, the National Hurricane Center began tracking the development of a storm several hundred miles south-southwest of Bermuda. On September 30, the storm was upgraded to Hurricane Joaquin. The forecast model from the National Weather Service had the storm potentially affecting the race weekend. However, updated models had the storm avoiding landfall on the Eastern U.S. seaboard and moving out into the North Atlantic. Nevertheless, heavy rain was expected to affect the Dover area. At the request of the drivers, on the Thursday before the race, NASCAR announced that the restart zone would be expanded from 70 feet (21 m) to 140 feet (43 m). Denny Hamlin took to Twitter to say NASCAR made a great move "to double the restart zone" and that it would give the leader of the race "more of an opportunity to decide when to start the race." Joey Logano said he was "[g]lad to see @NASCAR expanding the restart zone" and that it was "what a lot of drivers were asking for." The following scenarios were in play for this race. Carl Edwards would clinch a spot in the Contender Round if he finished 32nd or better with no laps led, 33rd if he led a lap or 34th if he led the most laps. Joey Logano would clinch by finishing at least 31st or better, 32nd with a lap led or 33rd with most laps led. Jimmie Johnson would clinch if he finished 25th or better, 26th if he leads a lap or 27th if he leads the most laps. Ryan Newman would clinch if he finished 16th or better, 17th if he led a lap or 18th if he led the most laps. Kurt Busch would clinches if he finished 15th or better, 16th if he led a lap or 17th if he led the most laps. Brad Keselowski would clinch if he finished 14th or better, 15th if he led a lap or 16th if he led the most laps. Martin Truex, Jr. would clinch if he finished 13th or better, 14th if he led a lap or 15th if he led the most laps. Jeff Gordon would clinch if he finished 10th or better, 11th if he led a lap or 12th if he led the most laps. Jamie McMurray, Dale Earnhardt, Jr., Kyle Busch, Paul Menard, Kevin Harvick and Clint Bowyer controlled their destinies only if they won. Otherwise, as would turn out to be the case for Earnhardt and Busch, they were dependent on other non-clinched drivers having bad point days. The entry list for the AAA 400 was released on Friday, September 25 at 2:27 p.m. Eastern time. Forty-four cars were entered for the race. The four driver changes for this race were J. J. Yeley returning to the No. 26 BK Racing Toyota, Josh Wise returning to the No. 32 Go FAS Racing Ford, Alex Kennedy returning to the No. 33 Hillman-Circle Sport LLC Chevrolet for the first time since Watkins Glen and Reed Sorenson returning to the No. 98 Premium Motorsports Ford. The threat of rain forced The Motorsports Group to withdraw its No. 30 Chevrolet entry from the race. Because of the withdrawal, all 43 cars remaining entered cars made the race. Matt Kenseth led the field to the green flag. Kasey Kahne was the fastest in the first practice session with a time of 22.429 and a speed of 160.506 mph (258.309 km/h). Kevin Harvick was the fastest in the final practice session with a time of 23.072 and a speed of 156.033 mph (251.111 km/h). The session only lasted 15 minutes before rain cut it short. Under cloudy Delaware skies, Matt Kenseth led the field to the green flag at 2:51 p.m. It only took until lap 3 for the first caution of the race to come out. This was when Josh Wise made contact with Jeb Burton in turn 1 and sent him spinning. The race restarted on lap 7. Just 10 laps later, Kenseth pulled to a one-second lead over his teammate Denny Hamlin. This lead began shrinking over the next six laps to just a quarter of a second over Kevin Harvick, who eventually took over that position on lap 25. As Harvick stayed out in front, he pulled to a two-second lead over Kenseth. The second caution of the race flew on lap 41. This was a scheduled competition caution for all the rain that the state of Delaware had throughout the entire weekend. Harvick swapped the lead with Kenseth on pit road and Hamlin exited with the lead. It was short-lived, as he and Jimmie Johnson were both tagged for speeding on pit road and restarted from the tail-end of the field. This would give the lead back to Harvick. The race restarted on lap 46. Harvick pulled to a five-second lead over Kyle Busch after 40 laps. After falling to the back on the restart for the speeding penalty, Hamlin was put down a lap by Harvick on lap 90. Jimmie Johnson made an unscheduled stop on lap 103 for an issue with the drive line. They couldn't fix it on pit road and he took the car to the garage. Following the race, he said that it was "tough having a very inexpensive axle seal be the culprit and take your championship hopes away. It's racing. I’ve had mechanicals take me out of championships growing up that led to some success for myself and I’m sure helped me with a championship or two. It’s just part of racing. It just shows how critical everything is on a race team. And how important every component is and you can’t take anything for granted. Heartbreaking for sure, but I don’t know what else we can do about it we just have to go on and try to win races and close out the season strong.” Debris on the front stretch brought out the third caution of the race on lap 111. The debris came from the No. 83 car of Matt DiBenedetto. Harvick swapped the lead with Busch on pit road, but exited with the lead. The race restarted on lap 118. Harvick once again pulled away from the field and began putting cars several of laps down. After 30 laps, he had lapped over half the field at least once. After 60 laps, he lapped everyone up to Brad Keselowski, who sat in 14th place. The fourth caution flew on lap 193 when Jeb Burton suffered a right-front tire blowout and slammed the wall in turn 2. He would go on to finish last. Harvick and Kyle Busch swapped the lead on pit road, but exited with the lead. The race restarted on lap 206. Debris on the front stretch brought out the fifth caution on lap 232. Harvick and Busch swapped the lead on pit road. This time, however, Busch took just right-side tires and exited with the lead. Hamlin was tagged for speeding on pit road and restarted from the tail-end of the field. The race restarted on lap 237. Harvick didn't waste any time passing the third and second–place cars. He drove under Busch in turn 2 to retake the lead on lap 249. The sixth caution flew on lap 312 when A. J. Allmendinger got loose and spun out in turn 4 while trying to get on pit road. Harvick and Busch again swapped the lead on pit road, but Harvick exited with it. With the stop being outside the 85-lap fuel window, most of the cars on the lead lap began shutting off their engines to conserve fuel. Kevin Harvick, seen here at the 2015 Daytona 500, scored his 31st career victory at Dover. The race restarted with 84 laps to go. The seventh caution of the race flew with 47 laps to go for a single-car wreck in turn 1. Brett Moffitt suffered a right-front tire blowout and slammed the wall. Matt Kenseth opted not to pit under the caution and assumed the lead. The race restarted with 42 laps to go. Kenseth was no match for Kevin Harvick on old tires and lost the lead to Kevin. The eighth caution of the race flew with 29 laps to go for fluid on the track. The fluid came from the No. 40 car of Landon Cassill after his engine blew up. The race restarted with 24 laps to go. Kevin Harvick drove on to score his 31st career victory. Harvick said that he was "just so proud of everybody from Stewart-Haas Racing to do everything that we’ve done the last three weeks, really. Obviously we weren’t in a great position coming in to today. That’s what these guys are made of and that’s what teamwork is all about." Following his runner-up finish, Kyle Busch said that the day was "really good...for us. I can't say enough about this entire Interstate Batteries team. They did a great job today. Adam Stevens gave me a great piece and when you look at the amount of practice time we had, it was pretty hard to figure out what you had. We had a second–place car and we finished second with it; nothing to hang our heads about." Dale Earnhardt, Jr. finished third and advanced to the Contender Round on a tiebreaker. After the race, he said that the closing laps weren't "nerve-wracking at all. You're either going to make it or you ain't. I'm going to try put together the best lap I can put together, and drive the car as hard as you can without over-driving it. You can't really worry about the big picture because you have to concentrate on running the lap. This place is so technical that you just have to concentrate on every corner and the mistake you made on the last one and how you make a better corner the next time through there. That's all you really worry about." A 12th–place finish was enough for Jeff Gordon to advance into the Contender Round. After the race, he said that making it involved "a lot of hard work. I'm proud of these guys. We fought hard and that's what we've been doing all year long. It hasn't been pretty. We've had a lot to overcome and we never give. That was pretty much what he had today, we survived and made it through." NBCSN covered the race on the television side. Rick Allen, 2006 race winner Jeff Burton and Steve Letarte had the call in the booth for the race. Dave Burns, Mike Massaro, Marty Snider and Kelli Stavast handled pit road on the television side. MRN had the radio call for the race, which was simulcast on Sirius XM NASCAR Radio. Joe Moore, Jeff Striegle and three–time Dover winner Rusty Wallace called the race from the booth when the field was racing down the front stretch. Mike Bagley called the race from the turn 3 stands when the field was racing down the backstretch. Alex Hayden, Winston Kelley and Steve Post handled pit road on the radio side. Matt Kenseth left Dover tied for the points lead with 11 other drivers. ^ Martin Truex, Jr. started the race from the rear of the field for unapproved adjustments. ^ "2015 NASCAR Schedule" (PDF). NASCAR.com. NASCAR Media Group, LLC. August 26, 2014. Retrieved September 28, 2015. ^ "Dover International Speedway". NASCAR.com. NASCAR Media Group, LLC. January 3, 2013. Retrieved September 28, 2015. ^ "Entry List". MRN.com. Motor Racing Network. September 28, 2015. Retrieved September 28, 2015. ^ "Starting Lineup". MRN.com. Motor Racing Network. October 2, 2015. Retrieved October 2, 2015. ^ "First Practice Results". MRN.com. Motor Racing Network. October 3, 2015. Retrieved October 3, 2015. ^ "Final Practice Results". MRN.com. Motor Racing Network. October 3, 2015. Retrieved October 3, 2015. ^ "AAA 400 Results". MRN.com. Motor Racing Network. October 4, 2015. Retrieved October 4, 2015. ^ "Points standings" (PDF). Jayski.com. NASCAR Statistics. October 4, 2015. Retrieved October 4, 2015. ^ "Manufacturer standings" (PDF). Jayski.com. NASCAR Integrated Marketing Communications. October 5, 2015. Retrieved October 5, 2015. ^ Paulsen (October 5, 2015). "NASCAR Overnights Dip Below 2.0 Again, This Time at Dover". SportsMediaWatch.com. Sports Media Watch. Retrieved October 6, 2015. ^ a b Paulsen (October 7, 2015). "NASCAR's Downward Trend Continues at Dover". SportsMediaWatch.com. Sports Media Watch. Retrieved October 9, 2015. ^ Thompson, Rich (September 28, 2015). "Kenseth leads Chase after win at Loudon". Boston Herald. Herald Media. Retrieved September 29, 2015. ^ Coble, Don (September 30, 2015). "Joe Gibbs has mixed emotions after latest win by his team". The Augusta Chronicle. Morris Communications Company, LLC. Morris News Service. Retrieved October 1, 2015. ^ a b Fleischman, Bill (October 1, 2015). "Tony Stewart: 'Right time' to retire after 2016 season". Philadelphia Daily News. Philadelphia Media Network (Digital), LLC. Retrieved October 1, 2015. ^ Palmer, Tod (September 30, 2015). "Kurt Busch believes Kansas Speedway race is pivotal in Sprint Cup chase". The Kansas City Star. Kansas City, Missouri: The Kansas City Star. Retrieved October 1, 2015. ^ Scott, David (September 27, 2015). "Brad Keselowski is the first to fall on restart issue". The Charlotte Observer. Loudon, New Hampshire: The Charlotte Observer. Retrieved October 1, 2015. ^ Long, Dustin (September 30, 2015). "Truex on Chase: 'You're just nervous and scared'". nascartalk.nbcsports.com. NBC Sports. Retrieved September 30, 2015. ^ Thompson, Rich (September 28, 2015). "NASCAR Notes: Gordon remains in Chase". Boston Herald. Herald Media. Retrieved September 29, 2015. ^ Turner, Jared (September 29, 2015). "In danger of missing next Chase round, is Dale Jr. done for?". FoxSports.com. Fox Sports Interactive Media, LLC. Retrieved September 30, 2015. ^ Gregory, Allen (September 28, 2015). "5 Things from New Hampshire and NASCAR". Bristol Herald Courier. BH Media Group Holdings, Inc. Retrieved September 29, 2015. ^ Thornton, Rob (September 29, 2015). "The Final Word – Kenseth Joins Hamlin At Loudon, Leaving The Rest To Scramble At Dover". speedwaymedia.com. USA TODAY Sports Digital Properties. Retrieved September 29, 2015. ^ Dutton, Monte (September 27, 2015). "Matt Kenseth Foils Kevin Harvick's Desperate Gamble in Round 2 of NASCAR Chase". BleacherReport.com. Bleacher Report, Inc. Retrieved September 29, 2015. ^ Bottano, Ron (September 29, 2015). "NASCAR: The Mystifying Eclipse of Clint Bowyer". motorsportsunplugged.com. Media Value, Inc. Retrieved September 30, 2015. ^ Blake, Eric (September 25, 2015). Tropical Weather Outlook (.TXT) (Report). Miami: National Hurricane Center. Retrieved October 1, 2015. ^ Fox, Ben; Turnquest, Ava; Winton, Tony (September 30, 2015). "Hurricane Joaquin gains force near Bahamas, heads toward US". ABC News. New York City: ABC News Internet Ventures. Associated Press. Retrieved October 1, 2015. ^ Turner, Jared (October 1, 2015). "Bleak weather outlook casts doubt on Dover race weekend schedule". FoxSports.com. Fox Sports Interactive Media, LLC. Retrieved October 1, 2015. ^ Hartnell, Neil (October 2, 2015). "Hurricane pounds Bahamas, unlikely to be big threat to U.S. East". Reuters. Nassau, Bahamas: Thomson Reuters. Reuters. Retrieved October 2, 2015. ^ Borenstein, Seth; Dishneau, David (October 2, 2015). "East Coast likely to dodge hurricane, but flooding looms". Associated Press. Washington, D.C. and Chincoteague, Virginia: AP News. Associated Press. Archived from the original on October 3, 2015. Retrieved October 2, 2015. ^ "NASCAR doubles restart zone for Dover". NASCAR.com. NASCAR Media Group, LLC. October 1, 2015. Retrieved October 1, 2015. ^ Denny Hamlin [@dennyhamlin] (October 1, 2015). "Great change by @nascar to double the restart zone. Gives leader more of a opportunity to decide when to start the race" (Tweet). Retrieved October 2, 2015 – via Twitter. ^ Joey Logano [@joeylogano] (October 1, 2015). "Glad to see @NASCAR expanding the restart zone. This is what a lot of drivers were asking for" (Tweet). Retrieved October 2, 2015 – via Twitter. ^ a b c d e f g h i "Chase-clinching scenarios for Dover". NASCAR.com. NASCAR Media Group, LLC. September 29, 2015. Retrieved September 30, 2015. ^ The Motorsports Group [@TMG30PR] (October 1, 2015). "With the threat of rain this weekend and qualifying being cancelled. @TMG30PR has withdrawn from this weekends race at @MonsterMile" (Tweet). Retrieved October 2, 2015 – via Twitter. ^ Gelston, Dan (October 2, 2015). "Rain at Dover washes out qualifying; Kenseth on pole". Associated Press. Dover, Delaware: AP Sports. Associated Press. Archived from the original on October 3, 2015. Retrieved October 3, 2015. ^ Gluck, Jeff (October 2, 2015). "Matt Kenseth on pole after Dover qualifying rained out". USA Today. Dover, Delaware: Gannett Satellite Information Network, Inc. Retrieved October 3, 2015. ^ Pistone, Pete (October 2, 2015). "Rain Cancels Friday Activities at Dover". MRN.com. Motor Racing Network. Retrieved October 2, 2015. ^ Motor Racing Network [@MRNRadio] (October 4, 2015). ". @MartinTruex_Jr will go to the back of the field after unapproved adjustments were discovered on the car. #AskMRN" (Tweet). Retrieved October 4, 2015 – via Twitter. ^ DeGroot, Nick (October 4, 2015). "NASCAR sends Truex to the rear after apparent body manipulation". Motorsport.com. Motorsport.com, Inc. Retrieved October 4, 2015. ^ Spencer, Lee (October 3, 2015). "Kasey Kahne leads abbreviated Cup practice". Motorsport.com. Motorsport.com, Inc. Retrieved October 3, 2015. ^ Long, Dustin (October 3, 2015). "Harvick fastest in final Sprint Cup practice shortened by rain". nascartalk.nbcsports.com. Dover, Delaware: NBC Sports. Retrieved October 3, 2015. ^ Spencer, Lee (October 3, 2015). "Happy Hour cut short by more rain at Dover". Motorsport.com. Motorsport.com, Inc. Retrieved October 4, 2015. ^ a b c d Gilder, Kellie V. (October 5, 2015). "Rundown: Analysis of all 43 cars at Dover". NASCAR.com. NASCAR Media Group, LLC. Retrieved October 6, 2015. ^ a b c d e f g "2015 AAA 400". Sprint Cup Series. Season 67. Dover, Delaware. October 4, 2015. Event occurs at 2:51 p.m. NBC Sports. NBCSN. Retrieved October 12, 2015. ^ a b Spencer, Lee (October 4, 2015). "Jimmie Johnson facing possible elimination after drive line issue". Motorsport.com. Motorsport.com, Inc. Retrieved October 5, 2015. ^ Bromberg, Nick (October 4, 2015). "Jimmie Johnson's Chase hopes end with Dover problems". sports.yahoo.com. NBC Sports Network, Stats LLC, Opta. Retrieved October 5, 2015. ^ a b Beard, Brock (October 4, 2015). "Jeb Burton - Not Jimmie Johnson - Last For The First Time At Dover". brock.lastcar.info. LASTCAR. Retrieved October 5, 2015. ^ Bonkowski, Jerry (October 4, 2015). "NASCAR at Dover: Harvick dominating at mid-point; Johnson in Jeopardy". nascartalk.nbcsports.com. NBC Sports. Retrieved October 4, 2015. ^ Gelston, Dan (October 4, 2015). "Harvick dominates in must-win race to advance in Chase". Associated Press. Dover, Delaware: AP Sports. Associated Press. Archived from the original on October 5, 2015. Retrieved October 4, 2015. ^ Mays, Robbie (October 4, 2015). "Harvick Dominates Dover to Advance". MRN.com. Dover, Delaware: Motor Racing Network. Retrieved October 4, 2015. ^ DeGroot, Nick (October 4, 2015). "Kyle Busch makes up the difference, keeping his Chase hopes alive". Motorsport.com. Motorsport.com, Inc. Retrieved October 5, 2015. ^ Hembree, Mike (October 5, 2015). "Dale Earnhardt Jr. barely advances in Chase for the Sprint Cup". USA Today. Dover, Delaware: Gannett Satellite Information Network, Inc. Retrieved October 4, 2015. ^ Pennell, Jay (October 4, 2015). "Earnhardt Jr. advances to next Chase round by besting McMurray". FoxSports.com. Fox Sports Interactive Media, LLC. Retrieved October 5, 2015. ^ Gluck, Jeff (October 5, 2015). "Kevin Harvick wins at Dover; Jimmie Johnson eliminated from Chase". USA Today. Dover, Delaware: Gannett Satellite Information Network, Inc. Retrieved October 4, 2015. ^ Crandall, Kelly (October 4, 2015). "McMurray, Johnson Among First Chase Eliminations". popularspeed.com. Popular Speed. Retrieved October 5, 2015. ^ Marquis, Andy (October 4, 2015). "Aric Almirola Quietly Races His Way to a Top-Five Finish at Dover". popularspeed.com. Popular Speed. Retrieved October 5, 2015. ^ a b Pistone, Pete (October 4, 2015). "Challenging Day For Truex Jr". MRN.com. Motor Racing Network. Retrieved October 5, 2015. ^ Tresolini, Kevin (October 5, 2015). "NASCAR fans treasure last glimpse of Gordon at Dover". The News Journal. Dover, Delaware: Gannett Satellite Information Network, Inc. Retrieved October 4, 2015. (Subscription required (help)). ^ Pennell, Jay (October 4, 2015). "Survive and advance: Jeff Gordon does just that in AAA 400 at Dover". FoxSports.com. Fox Sports Interactive Media, LLC. Retrieved October 5, 2015. ^ Vincent, Amanda (October 4, 2015). "Kevin Harvick wins at Dover to advance in Chase". autoracingdaily.com. Auto Racing Daily. Retrieved October 5, 2015. ^ Aragon, Dominic (October 4, 2015). "Comments from the four eliminated drivers". theracingexperts.com. The Racing Experts. Retrieved October 5, 2015.